Room blocks have been reserved for Energy Exchange 2019 attendees at 14 downtown Denver hotels within easy walking distance to the Colorado Convention Center. These properties fill up quickly, so make your reservations early to have the most options. All reservation requests prior to July 27th must be booked through the housing link found below, and the hotels are instructed NOT to take reservations from Energy Exchange attendees directly. To find your the perfect hotel room to meet all of your needs, simply click the button. You will then be directed to the Energy Exchange Housing Portal. Select “Government Sector” or “Private Sector”, as applicable, to view and select your room. For government sector employees, rates are set at federal per diem allowance. Government sector attendees must present a valid government or national lab ID at hotel check-in, where you may also be required to show tax exempt paperwork. Failure to present the proper id will result in a rate adjustment to the private sector rate. For all other non-government attendees in the private sector, discounted rates have been negotiated. Need to Change Your Reservation? Prior to July 27, 2019, if you need to adjust and/or cancel an existing reservation, simply log back in to the Energy Exchange Housing Portal using your booking acknowledgement # and associated email address. After July 27th, further instructions on booking and/or changing existing reservations will be communicated on the Housing Portal. Upon arrival in Denver, there are a number of ways to get from Denver International to your hotel, including taxis, shuttles, Uber, and Lyft. Once in the downtown area, there are a few RTD options for getting around the downtown area, including a free hybrid shuttle that runs the length of 16th street, only two blocks from the Convention Center. For an overview of your local transportation options, browse the Denver Downtown Arrival Guide. 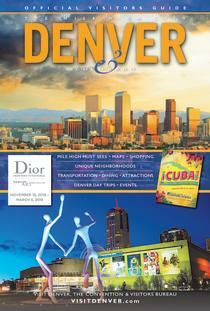 There is a wide variety of things to do, see, and experience while in Denver! Visit Denver.org to see what this city has to offer. Or, plan to make the most of your trip to the Mile High City with this mobile friendly city guide.